There are probably far more fake designer handbags on the streets than the real thing – most people don’t have the money to spend on a collection of real designer bags. But when people are shopping for the real thing, encountering endless counterfeits can be frustrating at the very least. There are a few general rules of thumb to follow, as well as specifics for different designers. If it seems too cheap to be true, it probably is, so you can be fairly certain it’s fake. If the seller – be it at a market or online – has lots of bags, they’re probably not the real thing; an inventory like that would cost a fortune if real. If the bag looks similar to a designer line but not quite the same, you can bet it’s probably fake. Some fake Coach bags actually have a GG instead of the signature CC. The stitching will probably not be exact, and the pattern not lined up properly. Most of the Coach bags will have a number embossed inside, not in ink (except for a few of the recent lines), and the distinctive Coach logo should be stamped on the majority of the hardware. Where the bag has a CC pattern outside, the lining will be plain (and vice versa), and the pull on the zip will either be leather, a single metal ring or a series of rings. The Gucci logo should be on the inside of the handbag, not the outside, and it should be the trademark GG. Look, too, for the identification card that should come with both the zip and the bag. If the bag is wrapped in plastic, chances are it’s a fake – Gucci doesn’t do that – and bags from proper retailers will include a box, dust bag and other extras. One thing Vuitton does that fakers generally can’t match is having the LV logo on the leather symmetrically. You will also often find that the LV on one side is upside down, since they manufacture from a single piece of leather, something counterfeiters won’t do. Zips should have an LV monogram, and the hardware should be real brass. Where lettering is embossed, the company always uses a very specific font. Prada bags will always say “Prada Made in Italy,” and the lining should have Prada going horizontally all through. All new Prada bags will come with a dust bag and authenticity tags, as well as a Prada serial number, and all the metal should have Prada engraved on it. Finally, the right leg on the R of Prada on the emblem should curve inwards slightly, something that tends not to be done on fakes. You can immediately discount any supposed Kate Spade bags in tie-dye, camouflage, or with a black stripe running on the top; the company has never used these designs. If the bags have large metal feet, they’re fakes – the feet should be no bigger than a 5p piece. If the bag is leather and the Kate Spade name isn’t embossed on, then you have a fake (other fabrics have fabric tags). The hardware on Burberry bags will either be gold or silver-toned (and be engraved with the name Burberry), and the embossing on the leather tab inside the bag will match the hardware colour. In the two most faked styles, Classic Check and Nova Check, the patterns will be aligned, meeting on both the bottom and the sides and be mirror images of each other. 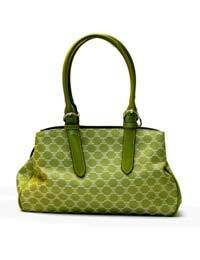 The first thing to be aware of with this bag is the colour – real ones never come in bright colours like yellow or pink. The zips should be silver, and the leather on the heavy padlock should be the same colour as the bag, with the key embossed with Chloe. Inside, real bags will have a serial number in a small pocket.